To those escaping the grey days of a wintry Britain, the bright light of Cape Town is quite a contrast; a peninsula surrounded by water on three sides, the city sparkles. 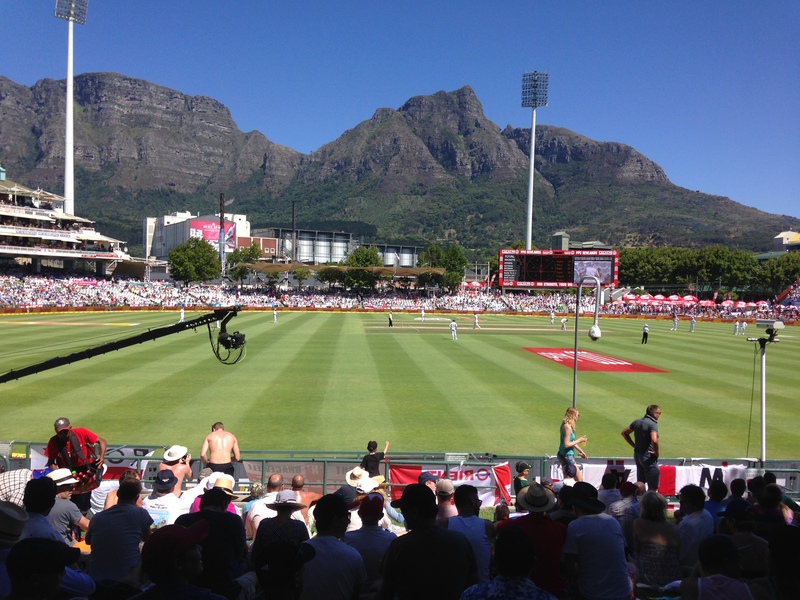 The brooding Table Mountain – looming up over 1,000m from sea level – is sometimes covered in its white table cloth, but the weather in town is consistently sunny and warm, the thermometer usually hovering around the 27C mark. The view from the Table top – after either a tiring but exhilarating 2.5-hour trek or a cushy seven-minute cable car ride (beware the queues after 11am) – is a good way to orient yourself and underlines the rich diversity of the Mother City. 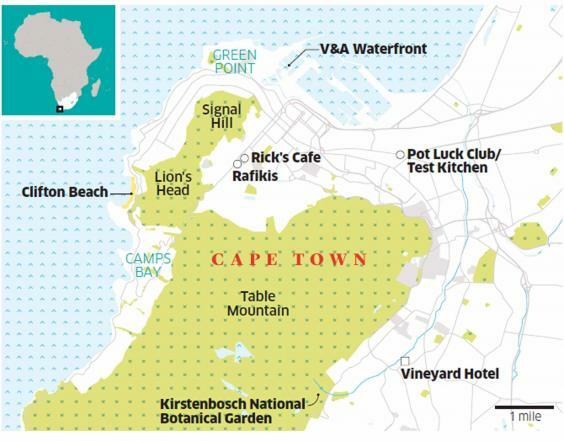 Immediately below is the City Bowl business district, punctuated by old suburbs – Cape Malay, dotted with pretty coloured cottages and quirky restaurants, the stylish villas and boutiques of the Cape Quarter, and the swanky Victoria and Albert Waterfront area beyond. Between Signal Hill and the jagged Lions Head (a considerably harder climb) is a glimpse of the spectacular beaches of Clifton and Camps Bay, backed by the rugged Twelve Apostles. In the opposite direction are the lush vineyards of Constantia and the superb Kirstenbosch National Botanical Garden (see “Don’t Miss”, right). The city is a fascinating polyglot of Europeans (Dutch and English), Africans, Asians (Malays and Indonesians) and everything in between. The cosmopolitan mix is reflected in the range of restaurants, from the touristy but fun Gold (African food, music and dancing; 00 27 21 421 4653; goldrestaurant.co.za) and bustling Millers Thumb (try the Cape Malay baked fish; 00 27 21 4243838; millersthumb.co.za) to and award-winning Test Kitchen (international fusion; 00 27 21 447 2337; thetestkitchen.co.za). And for one of the world’s most spectacular cities, it is remarkably cheap. The current exchange rate (22 rand to the pound) means dinner will usually cost less than a takeaway from your local tandoori. The Vineyard Hotel, in Newlands (00 27 21 657 4500;vineyard.co.za) is slightly out of town, round the back of Table Mountain, but it is an idyllic spot set in lush gardens with a beautiful pool and three restaurants (Myoga, the fine dining option, is outstanding). It’s also an excellent base for exploring the vineyards and Kirstenbosh Botanical Gardens. Double rooms from 2,190 rand (£101) including breakfast. A more central option is the Radisson Blu (00 27 21 441 3000;radissonblu.com/Capetown) on the waterfront at Granger Bay. The rooms are spacious, breakfast is served on a big terrace from which you can watch dolphins frollicking, and it’s a 10-minute walk from the attractions of the V&A Waterfront. Doubles from 2,500 rand (£115), room only. 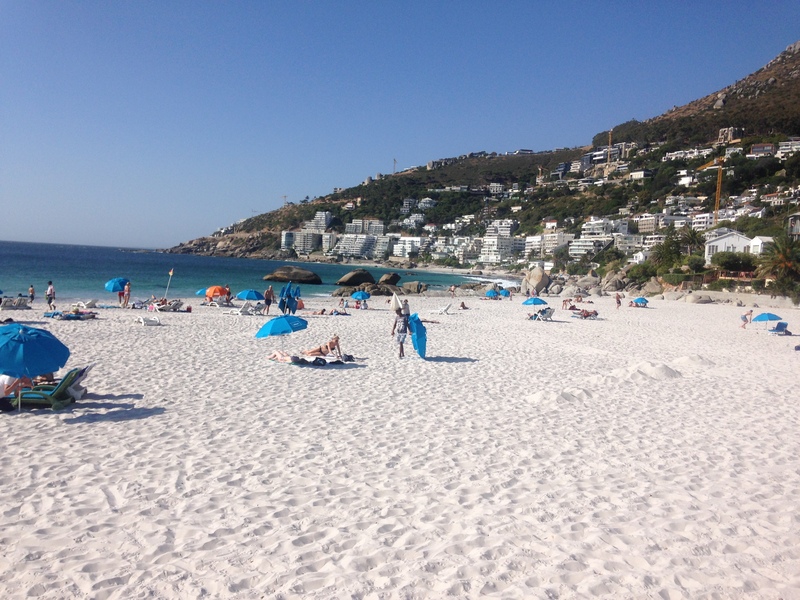 The four superb beaches of Clifton are a short cab ride from the city centre. They are separated by large boulders but you can walk between them. The best is No3 – the least overlooked, with the smallest waves (though the water is still freezing). There are no facilities but plenty of roving food and drink vendors. Twenty minutes further on, Beta Beach is rockier but more secluded and there is a natural bathing pool. For the more adventurous, a great way to see the coast is by tandem hang glider (00 27 76 892 2283; paraglide.co.za) from either Signal Hill or Lions Head (depending on weather). The spiral descent to the beach takes about 25 minutes and costs 1,150 rand (£53). Your taste buds will be gratified at the Pot Luck Club (00 27 21 447 0804; thepotluckclub.co.za). 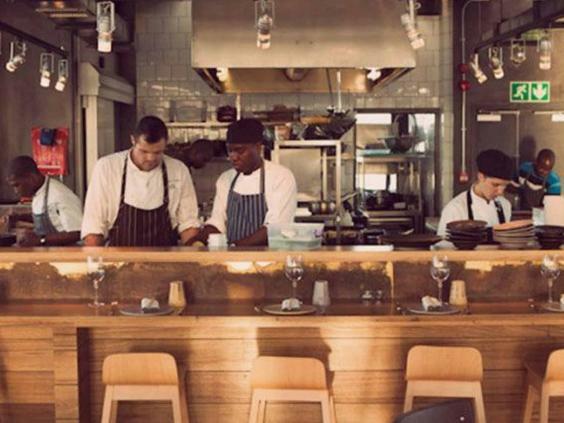 Sister restaurant to the Test Kitchen and located in the same building – the six storey Old Biscuit Mill in Woodstock – it has an ecclectic menu of sharing dishes, such as springbok carpaccio with smoked pine nuts or lime and miso cured trout. The desserts are works of art. It is hard to book, but Capetonians eat fairly early and I turned up after 9pm and got in easily. A bit further afield is Lekker Café (00 27 21 788 3424) in Kalk Bay, a laid back establishment serving a mix of the unfamiliar – biltong salad with goat’s cheese and figs – and the reliable – all day brunch, home-made lemonade, and great cakes. Heading up Kloof Nek Road towards the Table Mountain cable car station, you will pass a buzzy bar with drinkers spilling out on to the street and the first-floor veranda. This is Rafikis (00 27 21 426 4731) a bar-restaurant housed in a Victorian building with just a hint of the Wild West. In nearby Park Street, tables are set in the small front garden of Rick’s Café (00 27 21 424 1100; rickscafe.co.za), a rambling old house with a Moroccan-themed interior and Humphrey Bogart movie posters. Make the 45-minute journey by car to Mont Rochelle (00 27 82 948 1209; virginlimitededition.com) in Franschhoek. Founded in 1688, it’s set within its own vineyard. Franschhoek translates as “French corner” and it really feels like you have been whisked to Provence, with gastronomy to match. From here you can explore the region’s vineyards; there is even a wine-tram to take you between them. The boutiques of the Cape Quarter are worth a browse, it’s quieter and more distinct than the V&A Waterfront precincts. But the Watershed, in the V&A complex (00 27 21 408 7500;waterfront.co.za/shop/watershed) is a huge warehouse-style emporium selling authentic African ceramics, furniture, jewellery and textiles. I particularly liked a stand selling heads of African beasts (lions, rhinos, antelopes etc) made from old car parts. Set aside a morning to visit Robben Island (00 27 21 413 4200;robben-island.org.za), where all the guides are former inmates, and will tell you in detail about Nelson Mandela’s 18 years of incarceration here. On the boat trip over you might also spot whales, seals, and dolphins. Kirstenbosch National Botanical Garden (00 27 21 7998783;sanbi.org.za) nestles at the foot of Table Mountain, and spreads up its slopes. The gardens reflect the botanical diversity of the Western Cape with giant Stinkwoods and yellowwoods, a spectacular Protea display, and a steel and timber walkway that weaves through the tree canopy offering panoramic views of the city below. The shop is good for presents too. Simon Hughes flew to Cape Town with British Airways (0344 493 0787; ba.com) from Heathrow. Next story WAS BEN TOO STOKED UP?